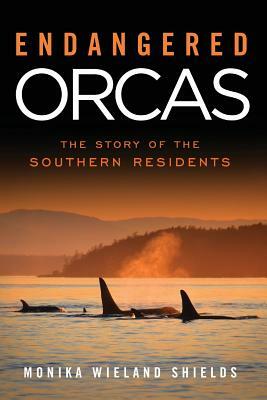 The most iconic whale in the Southern Resident Community of killer whales has been missing since November 2010. J1, nicknamed Ruffles for his wavy dorsal fin, has been the most recognizable whale in this population since it was first determined whales could be individually identified in the early 1970s. When they first started the photo ID study of these orcas, Ruffles was already a full adult male, leading researchers to estimate his birth date as 1950. This means that last year, at the age of 60, he was by far the oldest male among J-, K- and L-Pods. In truth, he could have been even older. This is especially remarkable when you consider that many other male killer whales die in their 20s and 30s. Since Ruffles' family has been seen often since last November, it is likely that he has passed away. It has taken me a while to write about his passing because it's a difficult thing to process. When I worked on a whale-watching boat, many return visitors remembered Ruffles and wanted to see him again. Others, first time whale-watchers, had heard about him and knew he was one whale they wanted to see. It seems like everyone in the whale world has at least one good Ruffles story. I first met Ruffles in the year 2000, and unlike most people I don't remember the first time I saw him. My natural affinity was with J2, Granny, Ruffles near-constant companion and potentially his mother. 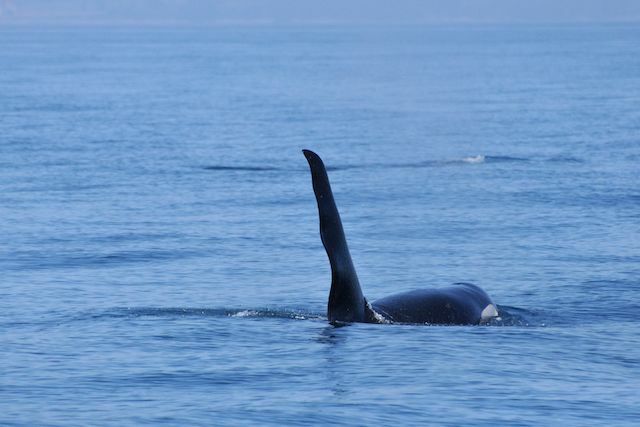 Still, he has been a continual presence in J-Pod since I came to knew these whales, and it seems like there is a hole now that he is gone. He and Granny together made such an impression on me that I painted a mural of them in our houseboat, and I sit underneath them every time I write a blog post. It's not quite accurate to say Ruffles was a friend, but for each whale encounter of mine over the last decade he has been a friendly presence, and I'm sad now that he is gone. While I have been lucky enough to have some close encounters with Ruffles over the years, my most lasting image of him is from far away. I picture him surfacing far offshore, his towering dorsal fin easily visible from a mile or more away. He had a characteristic way of surfacing: slow, deliberate, with a strong thrust of his flukes as he dove that caused the last visible tip of his dorsal fin to lurch forward just before it disappeared. 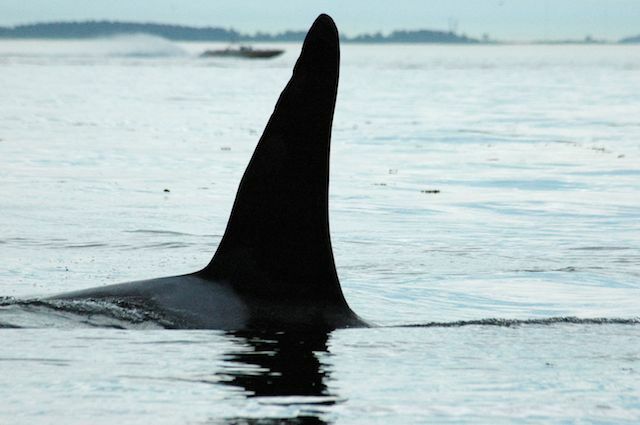 When the rest of J-Pod was tightly grouped or closer to shore, he might be off on his own, almost as if standing guard. Of course Ruffles wasn't always by himself. He often hung out with the young males; I think I've seen him traveling in close association with every J-Pod adult and sub-adult male. Everyone sort of thought of Ruffles as "the man" of the Southern Residents, and this view was somewhat substantiated with some genetic paternity research that was recently done on this population. It turns out that Ruffles was the father of quite a few whales, not only in K- and L-Pods, but even in J-Pod. This threw the assumption that whales only mate outside their own pod out the window. 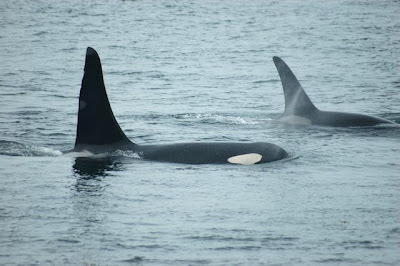 I always thought of Ruffles hanging out with these young males as being a tutoring session - maybe he was passing on his knowledge about being such a successful and long-lived orca. I really felt better equipped to honor Ruffles with a photo tribute, so I went through my hundreds of pictures of the big guy and put my favorite 25 Ruffles images in a photo gallery. I always knew he associated a lot with Granny and the young males, but one thing I never really noticed until I went through my photos was how much time Ruffles spent with some of the older females from the other pods, as well. I have a lot of pictures of him with K12 Sequim (born in 1970) and also with L7 Canuck (born in 1961). 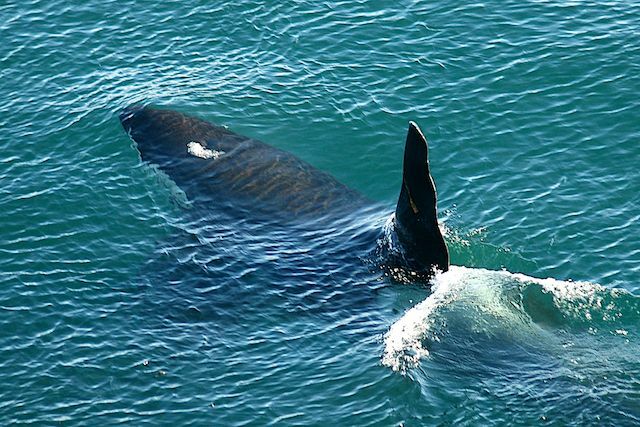 With Ruffles passing on, the oldest male among the Southern Residents is now 34 year-old L41 Mega. When I first started getting to know these whales, they were experiencing a scary bottleneck in adult males, with only four in the entire population. L58 Sparky died, leaving only three for quite some time (Ruffles, Mega, and L57 Faith, who has also passed on). Luckily, in part due to Ruffles' successful fathering of calves over the years, we now have about 10 adult males, with many more "sprouter" males on the way. 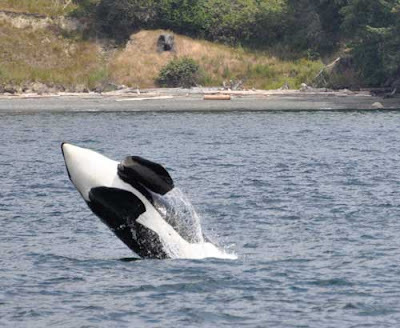 On one hand, Ruffles lived a very long and successful life for a male orca, and the deaths of some of our young males (like L73 Flash and L74 Saanich last year) is sadder in that it means something is happening to keep our breeding age males from surviving as long as Ruffles did. On the other hand, though, he is so well known to me and many others, that his loss is incredibly sad, too. I'll miss you, big guy. Please feel free to share your own memories of Ruffles in the comment section....I would love to hear them. Monika, thank you for sharing your love for Ruffles so beautifully. I was privileged to see him many times (though never a breach! )...often he cruised along side the boat, just us and him. That was how it went in September of 2010, my last time with him...he stayed with us for over an hour! I also remember him one day in absolute glass smooth water, late afternoon...he had separated from a larger group and stayed with us for a long time. I do consider him a friend. It was very strange to see J pod last weekend without him. Thanks for the tribute Monika; a great salute to a wonderful whale. Every trip Kathy worked on as a naturalist, my parting words to her were "Say hi to Ruffles for me." Maybe it was the similar age thing or perhaps having lived here for years, he was the only one i ever learned to identify, whatever, I felt an kinship with Ruffles. He was "The Man!" Thanks for writing this tribute. I just found out the news today and am really saddened. 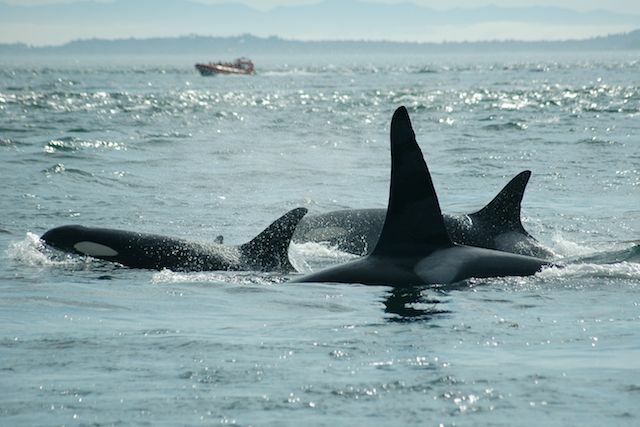 The first time I visited San Juan Island, I rushed to the shore for a glimpse of the orcas and was eventually greeted with the sight of Ruffles with other from his pod, heading up the coast. Breathtaking! When I visit again this summer, his presence will be truly missed! Im so glad iv found a tribute to such an amazing orca. Im from the UK and was lucky enough to see J Pod on a holiday to Vancouver. The thing i remember most was seeing Ruffles lead the way and investigate our boat,making sure everyone got a photo of him as well! He was the last to leave,making sure the newborn Echo and her mum were safely past the boat before having a last look at us disapearing out of sight. What he never knew was that the memory of that trip will never leave me,im so glad to have seen him,Thank you Ruffles. I lived in Seattle for two years and on three different occasions we went to Friday Harbor and sat at Lime Kiln Point and watched the orcas. The Orca Museum is amazing and watching them was truly moving. On the one occasion when I took a whale-watching boat trip Ruffles surfaced right beside the boat. That was easily one of the most awe-inspiring moments of my life and it put into perspective how small humans truly are. RIP Ruffles, you live on in my heart. I just found this as I was looking for background on Ruffles. Very sad news indeed. I'd seen him on every whale watch trip I'd been on, but had seen him up close in 2009 when the whales got together in one of their superpods. Being the most easily identifiable whale in the group it was very easy to pick him out from a distance, but having him surface so close that I couldn't fit him all in the photo was an amazing experience I will never forget. I met Ruffles and the J-pod in June 2001, when I participated in the Dutch militairy sailingteam at the Militairy World Sailing Championships at Esquimalt Navelbase near Victoria BC. The last day before we flew back home we did a whalewatching excursion from Victoria. I was so impressed by seeing these huge orca's so close! I'll never forget this! Since then I use the name Ruffles as a nickname and named my boat also "Ruffles". I hope to come back for a holidays in this region to show my wife the beauty of nature overthere en ofcourse see the whales again.